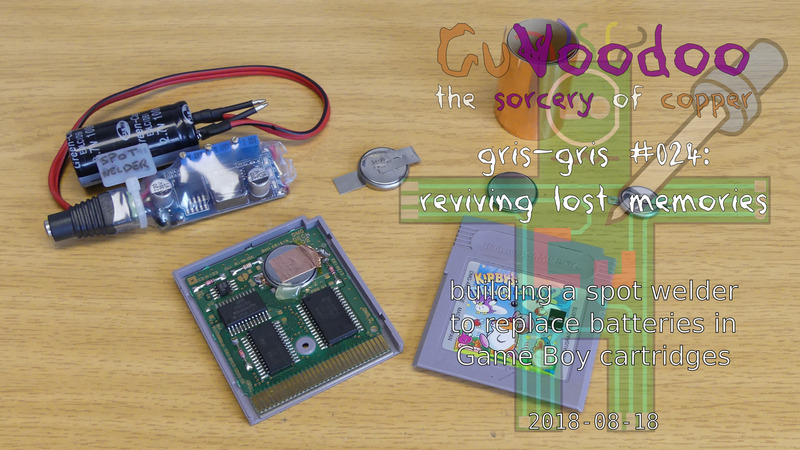 Game Boy game cartridges require energy from an internal battery to keep the save state. When this battery is depleted you can replace it using a coin cell and some copper tape. For better connections through metal tabs I also built a small spot welder using a super capacitor. I got all parts from AliExpress (100F super capacitor, LM2596 battery charger, nickel strip). Spot welders can also be built using a car battery and relay solenoid/starter, or a micro-wave transformer and solid state relay. This solution is larger and costs a bit more, but allows controlling the weld duration for repeatable results (instead of requiring experience). For even more professional spot welding (with energy control), have a look at the kWeld or Arduino Spot Welder (sources).